Celebrate National Hispanic Heritage Month (September 15-October 15) with literary archives gathered as part of the Recovering the U.S. Hispanic Literary Heritage Project. The Recovery Project is a nationwide initiative with the goal of locating and making accessible Hispanic literature in the United States – broadly defined to include a number of writings – created from the colonial period to 1960. The project defines literary archives inclusively in order to take into account a rich representation of documentary heritage; ranging from authors’ papers to historical texts and life writing (such as diaries and letters). Under the direction of Dr. Nicolás Kanellos, founder and director of Arte Público Press, the Recovery Project has produced several bibliographies (covering the dates 1600 to 2000) and publications. Combined these resources shed light onto the rich writings produced by Hispanic Americans as well as the complexities of the Recovery Project. With thanks to Carolina A. Villarroel (Brown Foundation Director of Research) who gave an excellent talk on the project at the Society of American Archivists meeting this year. You can also hear Hispanic American authors discuss their books at the Library of Congress through the National Hispanic Heritage Month portal. 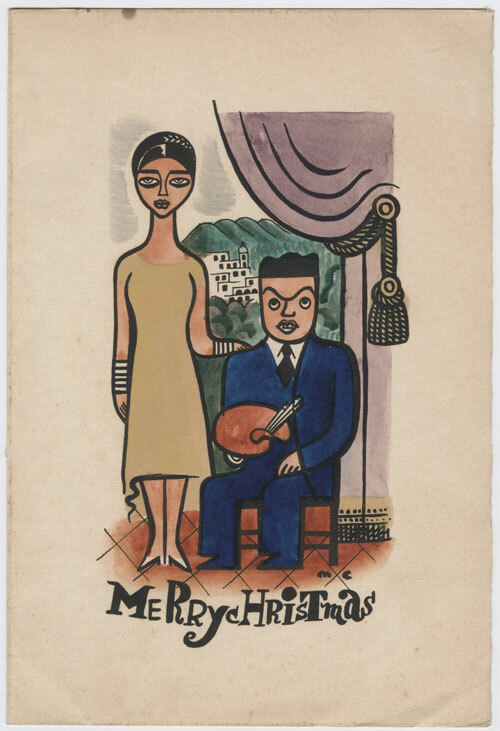 Hand painted Christmas card: Portrait of Rose and Miguel Covarrubias, Carl Van Vechten Papers. Yale Collection of American Literature, Beinecke Rare Book and Manuscript Library.